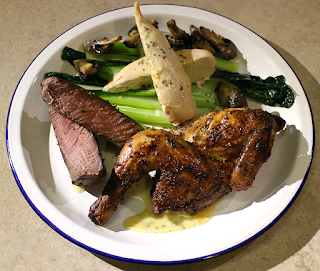 A carnivores delight but low in fat and carbs three bird dinner that's easy and quick to knock up. The poussin was prepared and seasoned already and I also cheated with a shop bought bearnaise base that simply needed blending with a pot of milk. For a prepared sauce it was actually very nice, but more to the point it was simply done in the van. 1. Heat the oven to gas mark 6. 2. Place the spatchcock poussin on a roasting tray and roast for about 30-40 minutes. 3. After 10 minutes loosely cover the chicken breasts with foil and also place in the oven. 4. Blanch the choy sum in boiling water then refresh in cold water. 5. Pan fry the ostrich steak to your likeness (about 90s a side for me) and set aside to rest. 7. In the pan used for the ostrich stir fry the mushrooms with a crushed clove of garlic and for the last minute add the blanched choy sum. Finish off with a squirt of lemon juice and season to taste. 8. Remove the poussin and chicken breasts from the oven, chop the poussin in half and plate up.